Thanks to its payouts potential, the Carousel slot game is one of the hottest items in Fugaso’s slot collection. When played for real money, this slot can pay prizes of up to 1,000 coins for a single five-of-a-kind win and pay way more than once due to its profitable mechanics. Add a progressive jackpot and a 96.1% RTP on top of such payouts and bonuses like free spins and you immediately get why this is a hit with Fugaso fans. Check out the free Carousel demo here or read on for our full slot review. If you miss the magic of old merry-go-rounds from your local amusement park, Fugaso’s new Carousel slot is here to give you a dose of nostalgia. 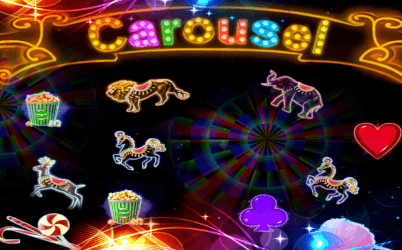 With its circus music, neon lights, and up to 720 ways to trigger prizes, Carousel will not only give you a slice of that funfair charm but it will also pay you really well for taking a ride. Available on mobile phones, desktops, and tablets, this is one nostalgic slot you can play no matter where you are. It doesn’t take much expertise to play Carousel. To start, you just need to choose how much cash you want to spend on each round you play. Since there are no paylines, the slot charges a fixed bet of 20 coins. With a minimum coin size of 0.01 credits, you can play with the lowest stake of 0.20 credits per spin. But if you want to win better prizes, you can also increase your coin size up to 1.5 credits and play with 30 credits per round (20 coins x 1.5 = 30). What you get with Carousel that you don’t get with many “standard” slot machines is the 720-ways mechanics. To collect a prize in this slot, you just need to collect three or more matching symbols on adjacent reels, starting with the leftmost reel. The positions your symbols occupy don’t matter, as long as they are found on reels that border each other. You can collect prizes with up to 8 regular symbols as well as 2 bonus icons. The payouts offered by the regular symbols vary from 2-200 coins while the bonus wild and scatter symbols can pay even bigger prizes of up to 500 and 1,000 coins, respectively. With 720 winning combinations available at all times, you can only imagine how many coins can be won with a single spin when you play for real money. And all these prizes can also be won while playing on the move, no matter the type of device you want to use. Most of Fugaso’s slot games are HTML5 games that were optimized for mobile playing and they are therefore compatible with most Android, Windows, and iOS mobile devices. To begin playing on your phone, just switch to landscape mode and use the large spin controls and menu button to control your session. Like any attractive slot game, Carousel by Fugaso is also equipped with a few bonus features. The one you’ll get to enjoy the most often is the clown wild symbol, which substitutes for all other symbols apart from the scatter to complete a payout. However, this symbol is available on all five reels only during the base game while during the free spins it is exclusively given on the 3‌rd reel only. To trigger the free spins, you will have to get at least three scatter symbols on your screen. Such a winning combination will not only pay you a bonus cash prize but it will also trigger 5 free spins. And if you get three more scatters during the free spins game, you can also re-trigger the feature again. If the free spins bonus is not enough to get you interested, the Carousel slot also offers other ways to make some extra money that just might. The first is the gamble function, which can be used to double any prize you collect by guessing the colour of the next drawn card. And the second and most attractive bonus is the slot’s progressive jackpot prize. Like all Fugaso jackpots, this one comes in Mini, Midi, and Maxi levels, all of which can be triggered randomly on any spin, no matter the size of your wager. Carousel by Fugaso is another exciting slot from the software developer with a fair RTP rate (96.1%) and the potential to pay big money. With its medium-high volatility, it really isn’t a slot for punters who want to play long sessions for cheap and see steady smaller returns. Its lower hit ratio certainly leaves room for bigger prizes to be won, but you will need to have the patience to wait for them. If this isn’t something you’re willing to do, perhaps other slots from Fugaso may be worth looking into. If you want a less volatile slot, Fugaso’s Horror Castle would be a good place to start. This online slot offers less risky playing sessions that are spiced up by bonuses like re-spins and free spins games. An even more interesting alternative is the Fear the Zombies slot which was inspired by the Walking Dead series. A mid-variance slot game, Fear the Zombies packs a variety of extras, including payout multipliers, free spins, and the same jackpot like Carousel. For a chance to see either of the slots in action, check out some of our top-rated casinos.